Home » amazing fact » chemistry » featured » general knowledge facts » letter j » periodic table » science » The letter J does not appear anywhere on the periodic table of the elements:Why? 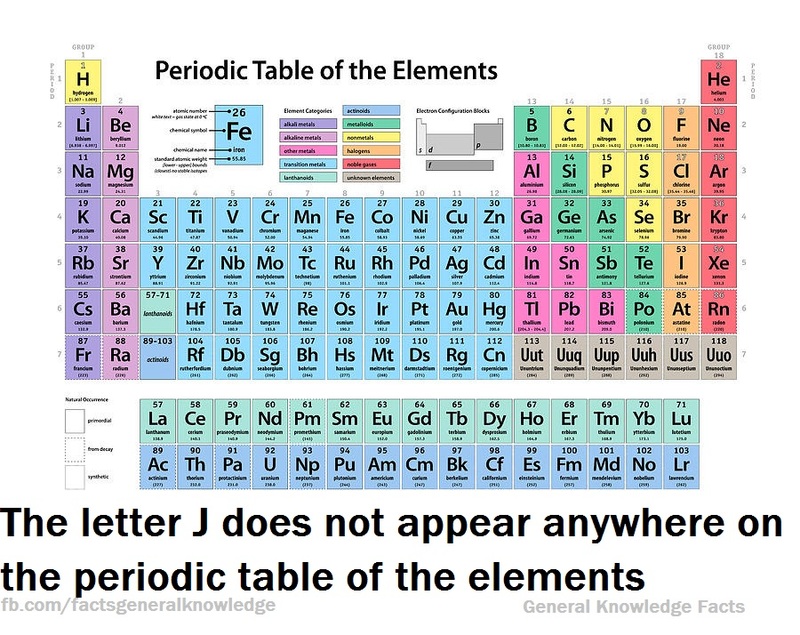 The letter J does not appear anywhere on the periodic table of the elements:Why? Every one reading this post must have know about the periodic table.The chemical elements are organised in increasing atomic number in the periodic table. 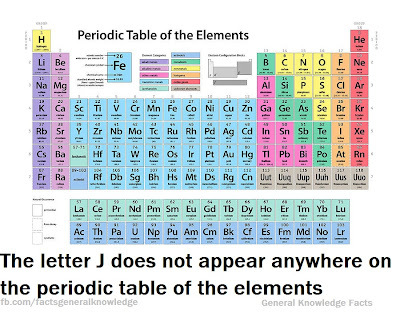 One thing I found strange was that the letter J is not present anywhere in the periodic table. Not only that it is not used as an atomic symbol it is not part of any element name. The letter q has at least one mention in the temporary name of element 114 , Ununquadium. In English language J is the fourth less frequently used letter (after Z X and Q).And the letter J was not used in Latin.And in many other languages J is not used (see this).This might probably be the reason why J is absent from the table. You can share your reasons on the comment box. "Stand in the possibility" that "J" the letter is not used in the PT, due to its connectedness with the letter Yod which means infinity. Material matter actually emanates from this letter... and well all of the letters if one were to get technical. How or why can/should this letter be on a chart that is a tool to study finiteness? Study the Hebrew alphabet and Torah and one may just learn more about life and really how it came into "bean." Make an attempt to separate religion from spirituality, which is a very challenging task to do.